Cole and Logan Layman have grown up making music together. In 2015 they met Hamed Barbarji, and this would be the beginning of an amazing friendship and a passionate collaboration. Nick Davidson joined the band in 2017 to complete this solid outfit. The band members are multi-instrumentalists and write original music. 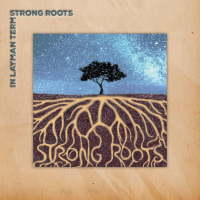 The new album by In Layman Terms, “Strong Roots,” is scheduled for release on November 7.